Maybe it is the Tunisian/Egyptian/Libyan effect but there are signs in several parts of the world that it is not a good idea to propose new legislation, without proper consultation and to which most people object. Britain has had to make a number of U-turns on policy recently as a result of popular pressure. Now something similar has happened in Tanzania. 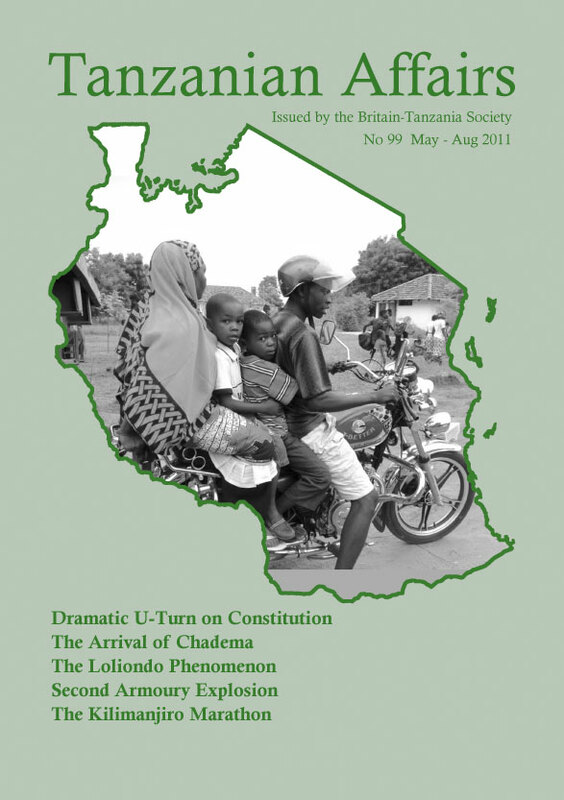 After the elections in October 2010, the greatly strengthened Chadema opposition party stated that, because it did not think that the presidential election results were correct and because there were many anomalies in Tanzania’s existing constitution, it wanted a new constitution to be adopted. The first reactions from the ruling CCM party were not favourable but soon it became apparent that this was a subject of great interest to the people. President Kikwete responded by setting up a Constitutional Review Commission and gave it instructions to draw up proposals for a draft Bill to be presented to parliament. The commission got to work immediately and in March 2011 presented a draft Bill for consideration by parliament at its next session in August. It was expected to lead to the enactment by 2014 of a constitution which would be an amended version of the existing one. It soon became apparent however that this was not what the people wanted. The Guardian, the Citizen and most other papers, English and Swahili, gave heavy coverage of the reactions. Former Prime Minister and retired judge Joseph Warioba praised the government for the goodwill it had shown in establishing a new constitution but faulted the ‘sanctity’ of the three issues that would dilute the whole process. Concerning the powers of the presidency, (which he said were classified as untouchable, in the Draft), were, in a real sense, the real constitution. “How can you refrain from discussing them?” The question of what kind of government they wanted; whether to have one government instead of the current situation where there are two, were among other things which they should be freely allowed to discuss he argued. He added that Section 9 of the Bill should be amended to give time to discuss the Draft. “Give people freedom to talk about human rights, about equality before the law and due process of the law. Listen to their views on the Union of Tanganyika and Zanzibar, on national unity and peace and let political parties campaign for the type of constitution, which represents the will of the people” he said. Civic United Front (CUF) National Chairman Prof Ibrahim Lipumba recommended the establishment of an independent Commission, a Constitutional Assembly, a National Convention and finally to hold a referendum – Guardian. Former Chief Justice Barnabas Samatta and the Legal and Human Rights Centre Executive Director urged the government not to restrict people’s involvement in the process of writing the new constitution. It should be clear and transparent and Tanzania should emulate countries that had recently changed their constitutions – Kenya, Ghana and South Africa. They strongly criticised a section of the Bill which prohibited members of the public from discussing issues about the Union, the Revolutionary Government of Zanzibar and the Government of National Unity there. waiting outside the Parliament buildings were people from all walks of life, including officials from civil society organisations and ordinary citizens. The huge turnout had been prompted by announcements popularising the event through the mass media the day before. Many students gathered in the middle of the road outside the parliament building and announced that they would continue with a separate public hearing of people’s views because the hearings inside ‘were meant for perpetrators of graft and not ordinary Tanzanians.’ When the situation became tense, police began using tear-gas to disperse the students, after some of them had started throwing all sorts of ‘missiles’, including stones, at the police. In Dar es Salaam another public hearing was temporarily suspended when a crowd of university students argued with an MP representing the CCM. The MP differed with those who questioned the proposed presidential powers in the bill, saying: “You cannot just decide to infringe upon the president’s powers through such a forum, and the Bill is right but…..” The crowd did not give him time to continue and the meeting became uncontrollable, forcing the chairperson to postpone the debate. At the Zanzibar hearings opposition was very strong. Some government leaders and House of Representatives MP’s had indicated earlier that the Bill could not be taken wholly as it stood. Isles Constitutional Affairs and Justice Minister Abubakar Bakari (supported by other ministers) said the Bill had violated the basic agreement setting up the Union and called on the Speaker to remove the Bill from the table. Anything warranting to be added or removed from ‘matters of the Union’ in the text must be discussed by both parties. Zanzibar had been sidelined right from the start because discussions had started without Zanzibaris being involved. On the last day of the open hearing in Zanzibar there was some chaos when the Chairman of the Zanzibar Association of Imams tore up the document. People chanted slogans such as: “We do not want the Union.” “No more Tanganyika’s colony.” This caused the session to be halted before its official closing time – Habari Leo. At the hearings many views were expressed: Many people said that they did not want to be rushed on the issue and were opposed to the idea of taking the Bill to Parliament under a certificate of urgency. Others said that the draft gave too much power to the President; people wanted a new constitution – not amendments to the present one. The Speaker of the National Assembly Anne Makinda accused politicians of creating chaos and disrupting on-going public hearings of the constitutional review, to advance their personal interests. Speaking in Parliament Chadema National Chairman Freeman Mbowe said his party planned to conduct demonstrations countrywide to press the government to halt the fast tracking approach to the constitutional review process. “If the government suspends endorsement of the Draft, Chadema would also suspend the planned demonstrations, he said. The fate of over 44 million Tanzanians could not be decided by a few people in Zanzibar, Dodoma and Dar es Salaam he added. The government finally decided to halt the ‘fast tracking’ process toward enactment of a new constitution. The Bill would no longer be presented to the August parliamentary session under a certificate of urgency. Normal channels would be used so as to allow the government to work on the opinions of the people and give more room for discussions. A few days after the reshuffles, CCM reaffirmed its commitment to fight corruption, and said that the fight would be won. The new Secretary General, vowed to act on all corrupt elements within the party and warned that those who continued to engage in corrupt practices would not be tolerated any more. “We wanted to make it clear that all those implicated in big corruption allegations should think of quitting. We want to protect our party’s credibility.” He also said that he would spare no one and was ready to make difficult decisions. In his first press conference, Nape Nnauye, the newly appointed CCM Publicity Secretary said they were fed up with lingering claims of unethical conduct in the party. “We will ultimately win this war (against corruption). We are determined to win, we have started it and we will sustain it to the end… “ He admitted that the party had massively lost people’s confidence –the Swahili press. Everyone has been expecting some sparks to fly following the election of a strong opposition in Parliament and they have not been disappointed. After the main elections last year, which were praised for their peaceful nature, there followed various mayoral elections. 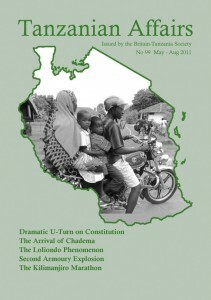 In the hotly contested one in Arusha on December 18 there were serious disturbances. Chadema leaders claimed that they were not informed of the election and when they arrived at the City Hall, found that it had already been completed, with a CCM candidate elected as Mayor and a TLP candidate as Deputy Mayor. In the resulting fracas the Arusha Urban MP (Chadema ) was injured while being arrested and taken to the police station. Chadema were then given permission to stage a demonstration and hold a public rally on January 5 but the decision on the demonstration was reversed on January 4. Chadema officials and supporters then defied the order concerning the demonstration and marched into the city, until they came up against a contingent of armed riot police blocking their path. There was a violent confrontation. Supporters continued to converge at the site of the planned rally (which had been given permission) but shortly after 1pm, police started firing teargas in an attempt to disperse the crowds. According to Mwananchi, prior to the demonstration, Chadema bussed hundreds of its young supporters from Kilimanjaro region. Reports say that police were later engaged in running battles with youths in downtown Arusha, and three people died from injuries. A number of policemen were also injured. On the following day, Mbowe and 40 others were charged with unlawful assembly. They all pleaded “not guilty” and were released on bail. Archbishop Josephat Lebulu of the Arusha Catholic Archdiocese read a declaration on behalf of the Union of Christian Denominations (representing over 20 denominations) which condemned the use of excessive force and live bullets by the police and called on Prime Minister, Mizengo Pinda to intervene. The church leaders also resolved not to recognise the Mayor nor work with the municipal officials until the controversy was resolved. On Feb 24th, thousands of protesters again took to the streets when Chadema held a demonstration in Mwanza, but there were no reports of violence (see below). In March prosecutors announced that the case against 10 of those arrested in Arusha had been dropped for lack of evidence and that the trial of 19 other Chadema members (including Mbowe and Slaa) would be postponed until April 29. CCM reacted angrily. A spokesman said that the government should take legal action against what he described as Chadema’s continued incitement. What Chadema was doing was to instill feelings of hatred between us and the people and thus provoke violence he said – Mwananchi. On March 3 Minister of State, Presidents’ Office (Social Relations and Co-ordination), Stephen Wassira warned Chadema, that they should blame no one if the government lost patience with them. He blamed the party for inciting people to overthrow their government. “It is not possible…..they don’t have such a mandate… as it is against the constitution” he said. 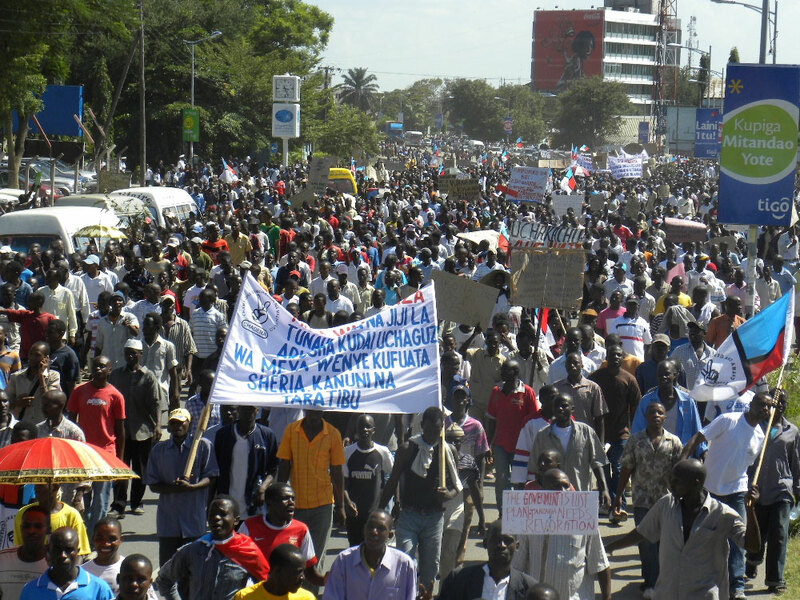 What Chadema was crying out for – an easing of the current high cost of living – was not a problem in Tanzania alone. Meanwhile, the Chairmen of the Tanzania Labor Party (TLP) and the United Democratic Party (UDP), John Cheyo, have supported President Kikwete’s warning to political parties against plans to destroy the existing peace – Mwananchi, Majira, Habari Leo. Chadema leader Mbowe has named his Shadow Cabinet. He said that, although the official cabinet had a total of 50 ministers and deputies, he had formed a small shadow cabinet of only 29 ministers and three deputies for efficiency. The Finance and Economic Affairs portfolio went to Kigoma North MP Zitto Kabwe who is also Deputy Leader of the Opposition. The Home Affairs shadow ministry will be headed by Godbless Lema (Arusha Urban), while Constitutional Affairs and Justice goes to Tundu Lissu of Singida East, who is the Chief Whip. The Energy and Minerals ministry will be under Ubungo MP John Mnyika – Guardian. MP’s have elected chairpersons for the three key parliamentary oversight committees. John Cheyo (UDP) was re-elected as chairman of the sensitive Public Accounts Committee (PAC), Zitto Kabwe (Chadema) also retained his position as the chairman of the Public Organisations Accounts Committee (Poac), while Augustine Mrema (TLP) was elected the new chairman of the Local Authorities Accounts Committee (LAAC). Thus, although Chadema was disappointed in not obtaining all three posts, Tanzania sets a good example in choosing as Chairs, members of the opposition parties. On February 10 CCM joined with all the small opposition parties in parliament to ‘clarify earlier rules’ to prevent Chadema from becoming the sole official Opposition in Parliament. The rules were changed so that the official opposition now comprises all the opposition parties. Chadema MP’s walked of the House in protest. Relations between Chadema and the second opposition party CUF remained cold – Guardian. Forget about politics! Forget about football! Forget about corruption! One topic above all has dominated conversations in Tanzania during recent weeks – the tens of thousands of people who have been flocking to Samunge village, Loliondo in Arusha Region to try a ‘miracle’ cure’ being dispensed there by retired 76-year old Evangelical Lutheran Pastor Ambilikile Masapila. So many people have gone to the village that shortage of food and water initially sent prices soaring. A 1.5-litre bottle of water was selling at between TShs 4,000 and 5,000. Thousands of patients have been stuck in 25-km traffic jams on the road. The Pastor said that the cure was revealed to him by God. It heals all chronic diseases like HIV/Aids, cancer, hypertension, diabetes, asthma, and many others. Its dosage is only one 250 millilitre cup made by boiling mugariga treeroots. The former Pastor admitted that he was overwhelmed by the huge turnout of people from all corners of Tanzania and neighbouring countries. But he told reporters that he was ready and able to dispense his liquid concoction of herbs in person to everyone turning up for healing “as directed by God”. He had been touched by the unfolding humanitarian catastrophe that had led to deaths of sick people collapsing while queuing to reach him. By April the death toll had reached seventy-eight. 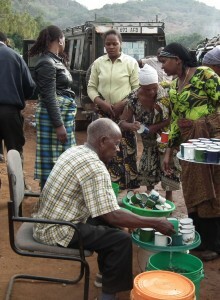 Patients pay 500 Tanzanian shillings – about $0.33 – for one cup. Among those seeking the cure were several public figures – including government ministers. One of the patients was said to be the wife of the President of the Congo. Politicians were said to be using the cure with many spending large amounts of money to arrange transport for their constituents to Loliondo. “I have set aside Sh 12 million to arrange transport for 200 of my constituents admitted Arusha MP (Chadema), Godbless Lema – Majira. In March Prime Minister Mizengo Pinda promised to supply tents and build a dispensary in the village to treat patients needing medication before or after getting the herbal drink – Guardian. Tourist hunters will have to dig deeper into their pockets following the government’s decision to increase the permit fee for its hunting blocks from $27,000 to $60,000 for category I. Minister for Natural Resources and Tourism Ezekiel Maige said that the government had responded to the public outcry by increasing the number of hunting blocks from 158 to 190 and had also categorised the blocks into five depending on the type and number of animals to be hunted. He said Tanzanian applicants are required to produce a bank bond of guarantee to the tune of at least $300,000 and for a foreign owned hunting company a bank bond of $1,000,000 is required. Experts have predicted that the Tanzania hunting sector could earn some $ 53 million annually – a dramatic increase from the present earnings of $ 20 million This would bring the sector closer to being one of the country’s largest foreign exchange earners. According to the Sunday News, some 21 of the professional hunters issued with permits under the new regulations have decided to hand their permits back because of the lack of animals in the areas covered. The Minister of Tourism suspects that, apart from ordinary migrations of the animals, poachers may be responsible. The government would step up its efforts to control this he said. President Kikwete has made a statement on the governments intentions as regards the controversial proposed road through the Serengeti. ‘The Government has reassured the international community that Tanzania will never do anything to hurt or take any decision that may irresponsibly destroy the Serengeti National Park such as building a tarmac road through the Park. However, the Government has reiterated its commitment to meet its responsibilities of supporting development efforts of poorer communities living around the park including building a tarmac road on the northern tip of the park to ease the severe transport challenges facing those communities. The Serengeti is a jewel of our nation and the international community….We will do nothing to hurt the Serengeti and we would like the international community to know this… There has been so much unnecessary confusion about this issue. Let me give you my assurances that we will keep the Serengeti intact. Under the plan, the Government wants to decongest traffic inside the park that currently crosses the Serengeti daily on a 220-kilometer road which passes right through the park. Instead, the planned road will cross the Serengeti for only 54 kilometers which will remain unpaved. Action by Parliament, the media and the judiciary continue on several allegations of corruption and Tanzania has again set a good example by revealing to the public more and more new cases of alleged corruption, or inefficiency in the public service. In what The East African describes as the ‘Scandal which just won’t go away’ (it was in 2006 that TANESCO contracted the Richmond Development Company to supply emergency electricity to Tanzania’s Tanesco) there has been a major new development. In 2008 Dowans (the company which took over from Richmond because the latter did not perform satisfactorily) appealed to the International Commercial Court (ICC) to arbitrate in its dispute with the government. The previous history of this case has been covered extensively in earlier issues of TA. In December 2010 the ICC ruled in favour of Dowans and required Tanzania to pay $65.8 million (TShs 94 billion) compensation for breach of contract by Tanesco. Tanzanians were shocked at the size of the award and many were very angry and wanted the government to refuse to pay. The President, parliament and the media were immediately involved in a huge controversy. Should Tanzania pay or not? Energy and Minerals minister William Ngeleja announced that he had received instructions from Attorney General Frederick Werema to pay Dowans. East African Cooperation minister Samwel Sitta and Works Deputy minister Dr Harrison Mwakyembe queried the legality and the speed with which the problem was being handled. In a speech broadcast live on radio and television President Kikwete said he was not for or against payment. He said the issue was legal and the government would do everything possible to ensure that the penalty was successfully challenged so as to spare taxpayers the enormous cost. He also declared that he neither had shares in Dowans nor did he know the firm, adding that he was not protecting ‘friends’ alleged to have a stake in the company…. I don’t have even a single cent in shares in Dowans…..I agree with those who say that we should not hasten to pay Dowans all those billions of shillings,” he added. Prime Minister Mizengo Pinda said a CCM committee had resolved to engage legal experts in pursuing the case so as to spare Tanzanian taxpayers. On February 20 the previously mysterious owner/principal shareholder of Dowans arrived in Dar es Salaam. He is Brigadier General (retired) Sulaiman Mohammed Yahya Al Adawi from Oman. He said that he had come to negotiate with Tanesco and talked of the possibility of varying some of the damages due to him. He did not want his photograph to be taken. He said he formed Dowans Ltd with the aim of assisting Tanzania with its power problems. He wondered the why the media had portrayed his company so badly. The next day Mr Al Adawi visited the generating plant. According to the Citizen, while entering the premises, security guards were seen saluting and no reporter was allowed to cover the visit. When asked later who the visitor was, the security guards said they did not know him but as he was accompanied by three people from the company they had allowed him in. 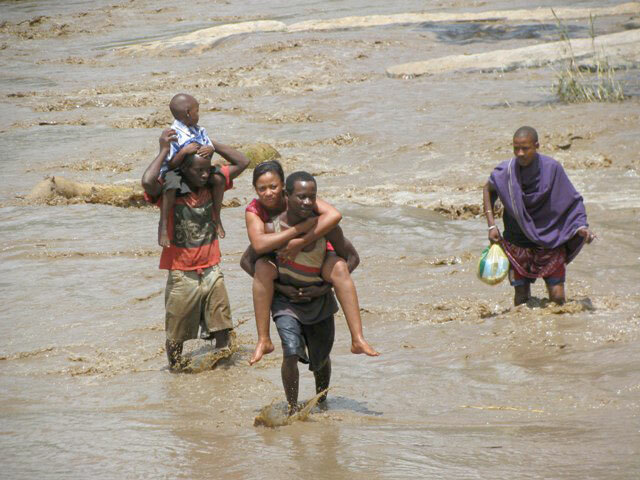 In mid April, in a court case involving Richmond’s Tanzania Director, evidence was given which alleged that the Richmond Development Company LLC of Texas, had been ranked last among eight companies which had submitted bids for the original tender to produce 100 megawatts of emergency power. It was alleged that in the evaluation of the bids Richmond failed in the technical specifications but at a later stage the tender documents were taken over by the government – Majira. Mr Chenge resigned on April 20, 2008 as minister of Infrastructure at the height of the radar scandal investigations. His resignation followed a public backlash after it was revealed by the SFO that he had stashed about $1 million away in an offshore account as kickbacks from the military radar deal – Guardian. Tanzania and Kenya have unveiled plans to replace the radar system in their air traffic control with Automatic Dependent Survey Broadcast (ADS-B). The Prevention and Combating of Corruption Bureau has fired six of its employees and mutually agreed not to renew the contracts of five others due to unethical conduct. At the annual PCCB workers’ convention in Arusha the head of the Bureau said that last year the PCCB had prosecuted 10 major corruption cases and 8 others had been submitted to the Director of Public Prosecutions for consent to prosecute. Speaking at the same meeting the new Vice President of Tanzania, Dr. Mohammed Gharib Bilal, told leaders that they should concentrate their efforts on local government authorities and construction sector projects….. “We have major problems in procurement as we have little value for money in most such projects” he said – Mwananchi. Former President Benjamin Mkapa and his wife, Anna, have wound up their company (voluntary liquidation), ANBEM Limited which was alleged to have been linked with the controversial acquisition of the state-owned Kiwira coal mine. According to the Citizen, the ANBEM saga has damaged the legacy of Mr Mkapa, who was credited with transforming the economy and enhancing public accountability during his 1995-2005 tenure. But several politicians have strongly defended the former President, terming certain allegations of abuse of office as ‘baseless’. Minister of Construction John Magufuli has exposed a massive plot to cheat the government of an amount to the tune of Shs 5 billion for a Dar es Salaam road construction project. The Minister went to the site to find out the actual number of houses that would need to be compensated to allow the project take off. It was alleged that evaluation officials from Ilala, Kinondoni and Temeke municipalities had plotted to increase the costs. In some cases houses were ‘ghost’ ones. The minister directed all Dar Salaam District Commissioners to review the situation and report back to him as soon as possible – Mtanzania. The Parliamentary Standing Committee on Energy and Minerals has ordered Tanesco to submit to them all contracts entered into with gas exploration firms after the Committee became suspicious of the terms awarded to some firms. The Committee discovered that Tanesco had entered into a contract with a foreign firm that obliged it to buy gas for electricity production in US dollars rather than Tanzanian shillings which was not correct – Tanzania Daima. The Controller and Auditor General (CAG) has released a new report that shows massive faults in keeping proper government accounts. The report queries over-expenditure of a TShs 48 billion stimulus package, meant for rescuing businesses affected by the global financial and economic crisis. Speaking to journalists in Dodoma, the CAG, Ludovick Utouh, said he found no records to show who benefited with the package. Utouh also queried the delay in implementation of the national identity cards project saying it caused great losses to the nation – Mwananchi. There were violent explosions at the Gongo la Mboto armoury on the outskirts of Dar es Salaam on February 16 which killed 23 citizens and left scores injured. Bombs exploded in quick succession, lighting up the skies and causing panic among city dwellers fleeing for their lives. The last bomb exploded the following morning at around 4am damaging six military vehicles. Over 4,000 people left their houses and properties to take shelter at the Uhuru Stadium. 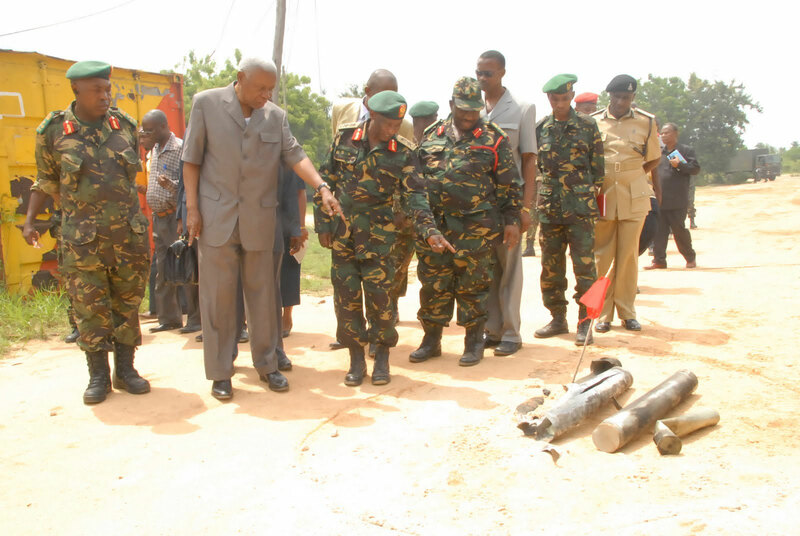 Two missile remains landed inside Prime Minister Pinda’s private residence in the Pugu area, a few kilometers from the explosion site. One of the PM’s housekeepers told reporters that one shell destroyed a mango tree in the PM’s compound as another exploded on the bare ground. Efforts by Mwananchi photographers to take photos of the area were in vain as security men grabbed their cameras and deleted everything in them. The PM briefed MP’s on what had happened. The incident occurred at 8.20pm, when a blast started at munitions depot number five, where military equipment including heavy bombs, were stored. Reports of the blasts reached top army officials, but before they could do anything, the blasts had spread to 22 other munitions depots very fast leaving mass destruction. The bombs destroyed two dormitories used by soldiers plus their vehicles. Some civilian houses were also destroyed as was part of a secondary school. Several bombs hit the Julius Nyerere International Airport and plane movements were interrupted. The government was criticized for not seeming to be sufficiently serious about public safety related to munitions depots that share locations with residential neighbourhoods. Two years earlier similar blasts had occurred at another army base which also led to loss of lives, disfigurement of some people, and destruction of property. 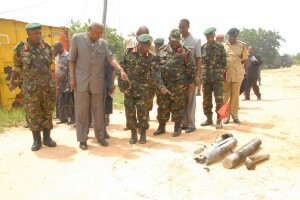 Explosion experts from the US and Russia came to Tanzania to help with the subsequent enquiry – Guardian . The Government budget for fiscal year 2010/2011 was an ambitious one, increasing from TShs 9.5 trillion in 2009/10 to TShs 11.6 trillion. Reaching the revenue targets of this budget has been challenging. By January 2011, tax revenue collection was just over 90 percent of the budgeted revenue, and the shortfall in project grants was even larger at 71 percent, leading to an equivalent shortfall in development expenditure. There will be further pressure on revenue collections if the current power shortages continue and consequently industries and businesses cut their operations. TRA Director of Research and Policy, Mr Tonedeus Muganyizi told members of the Parliamentary Committee for Energy and Minerals in Dar es Salaam that the deficit in collection during the second half of the financial year may be as much as 30 percent. Strategies for dealing with the power shortages have been proposed: settling the Dowans dispute and providing fuel to run the IPTL generators. Recent rainfall in catchment areas of the large hydro systems have helped somewhat to alleviate the problem. A mission from the African Department of the International Monetary Fund (IMF) visited Tanzania during March 4-16, 2011. The IMF estimates that GDP growth in 2010 was 7 percent, and exports grew – manufacturing exports nearly doubled in the year. Projections for 2011 suggest a slower growth of 6 percent because of power shortages. With investment in additional electricity generation, the economy should bounce back, so that by the end of 2011, the rate of growth is expected to be 7 percent. One morning early in March, petty traders operating in the secondhand clothes market in Manzese found their stalls demolished in an exercise of Kinondoni municipal authorities with the support of the municipal auxiliary police. The traders had not been warned or notified of the pending demolition. Several people were reported to have been injured when the police used live ammunition and tear gas canisters to disperse petty traders who were protesting against the demolition exercise, blocking Morogoro road to express their grievances. The Kinondoni municipal council said the area needed to be cleared for the construction of infrastructure needed for the Dar es Salaam Rapid Transit (Dart) project. Valerie Leach lived in Tanzania from 1994 to 2007. Initially recruited to work with UNICEF in monitoring, evaluation and social policy, she went on to be a policy analyst with REPOA, an independent Tanzanian research institution based in Dar es Salaam. She returned to UK in 2007, together with her adopted Tanzanian children, Francis and Rose, where she continues to contribute to REPOA’s work.